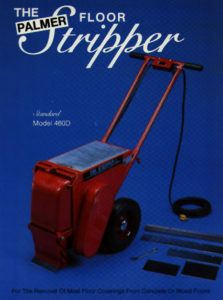 Palmer Floor Stripper's are used to remove linoleum tile and glue from wooden or concrete floors. They can also be used to remove adhesives left behind from previously removed floor treatments. Ask a Toomey's Rental Technician for information regarding the right blade for any given job. Blades are available for wood and concrete floors. Due to the size and weight of this tool Toomey's recommends seeking an additional person when loading and unloading this machine.